First, choose your wine...then match it with a sparkling juice. (ALDI's sparkling juices taste even better than National brand sparkling juices.) I would also like to mention ALDI wines taste great and are very cheap! They even have a sweet red, that actually says "Sweet Red" on the bottle, so it should be easy to find. ALDI has many nice tasting wines for 2.99 - 6.99 a bottle! Next, choose a fruit for garnish, or mint leaves. 2. Petite Pink: Mix red wine with sparkling cranberry and lemon juice, and garnish with mint leaves. 4. Chamberry: Champagne + Cranberry Juice + 1 tsp. sugar. Add cranberries. You can even throw a shot of gin in these for an extra punch. Gin is usually the best hard alcohol to go with in fruity drinks because it tastes more fruity than other hard alcohols. You can also make little fruit kabobs and stick them in the drinks! Just another idea to get you thinking outside the box. Your plain old glass of wine, doesn't have to be so plain and boring. Especially when entertaining. Mix things up a bit. Come up with your own combinations and have fun with it. Do you have a favorite combination? Leave your comment here! Thanks for all your posts! I check in all the time. I love the reviews, recipes and tips. Hi there! I am Kristal. I am a work at home mom running a daytime childcare service out of my home. I also have a degree in Photography and occasionally shoot weddings and more. I live in St.Louis, Missouri with my husband, five year old daughter, and our furbaby, Leo. I do not get paid by Aldi to run this blog. I am simply an Aldi fan, and I want to show people how they can live better and save money by shopping at Aldi, which is something I discovered on my own. 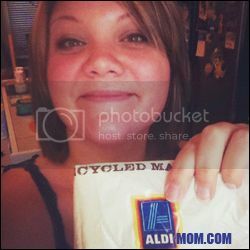 I created Aldi Moms in June of 2012 and it has quickly launched. Aldi Moms is for Aldi fans to share Aldi reviews, Aldi recipes, photos, deals, comparisons, and anything related! Read about why I started blogging here. Put a button on your website or blog and link it back here to show your Aldi pride!